My son likes Steamed egg with minced meat, here is another variation that uses the Minced meat sauce that I made earlier, he finished all. 1. Cracked, and weigh the eggs, two medium size organic eggs is 101 gm for me. Add 200 gm of water and a pinch of salt. (Egg water ratio 1:2 is what I liked most.). 2. Whisk the mixture until it is fully incorporated, leave aside and wait for 10 minutes to settle some of the bubbles. Pour the mixture in a bowl. Remove any remaining bubbles on the surface gently using a spoon. 3. Cover the bowl with foil paper, this is to prevent any steam/water dripping onto the steamed egg. 4. 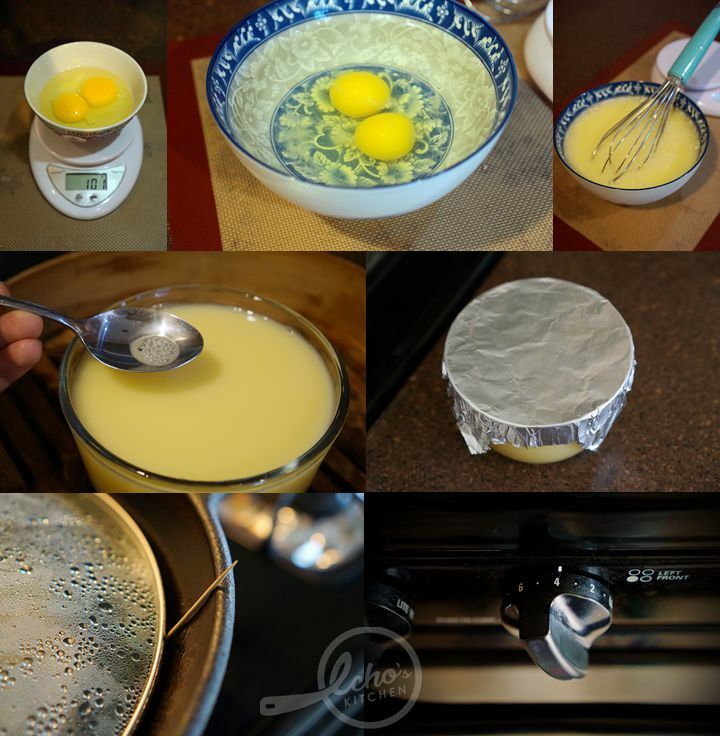 Heat the steamer with 2 cups of water, turn the heat to medium low, place the bowl in steamer with the lid a little ajar, I inserted a toothpick between lid and steamer to allow release of little steam, this step is to prevent overheating, consistent medium low heat delivers smooth custard like steamed egg. 5. Steam the egg for 15 minutes, switch off the stove and remove the toothpick, let the egg sit in the steamer with lid tightly covered for 5 minutes. 6. Meanwhile, heat 2-3 tbsp of Minced Meat Sauce on the stove or in microwave. 7. 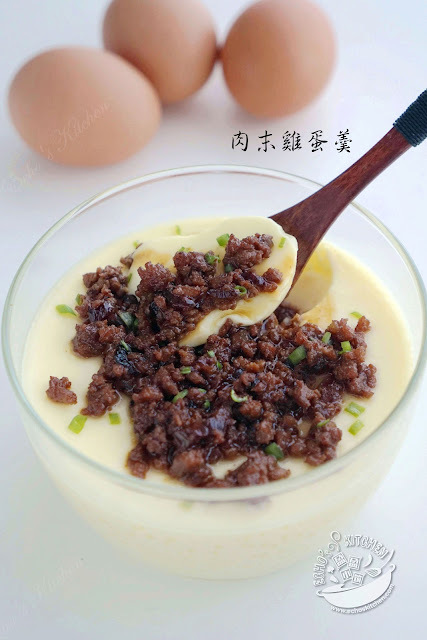 Remove the foil paper cover, spread the minced meat sauce over steamed egg, serve warm.